NECKLACE - SARAH COVENTRY. "ESCAPADE" FROM 1980. 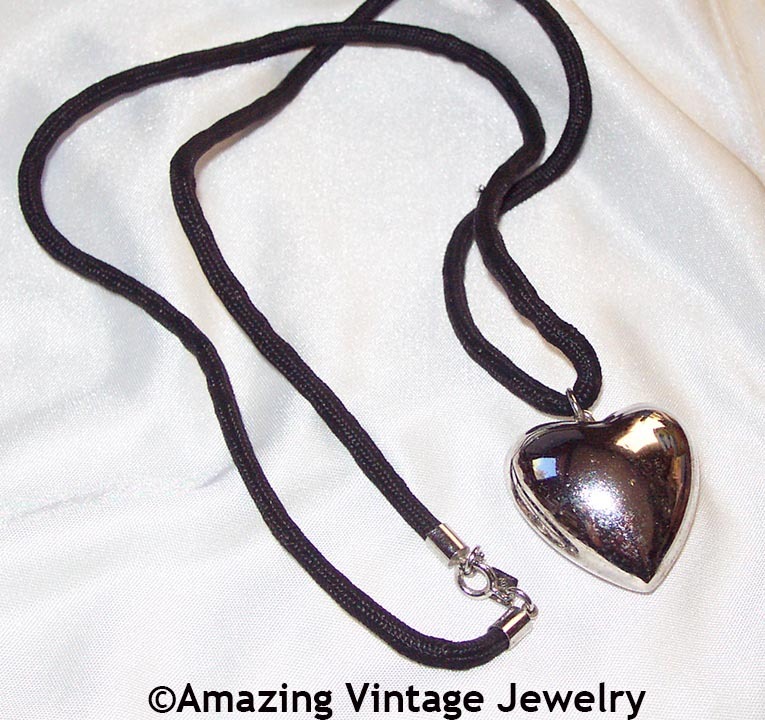 UNUSUAL LARGE, SHINY, PUFFY SILVERTONE HEART ON A BLACK CORD - BOTH FLIRTY AND FUN! PENDANT IS 1 3/8" LONG, 1 1/4" ACROSS. CORD IS 30" LONG. OVERALL VERY GOOD CONDITION - PUFF HEART HAS SOME SCRATCHES AND ONE SMALL DENT WHICH IS VERY HARD TO SEE. CORD HAS A SMALL PICK, AS SEEN IN THE PHOTO. PRICED ACCORDINGLY.